Giant cats who walk on a leash, play fetch and snuggle up to you at bedtime? No, this isn't bizarro world. This isn't Apocalypse Meow. This is real. And it's brutal. They're called Savannah cats, a cross between a regular domestic cat and the wilder (and larger) serval - which accounts for the animal's stupendous proportions. They're also touted by breeders as downright doglike in disposition. 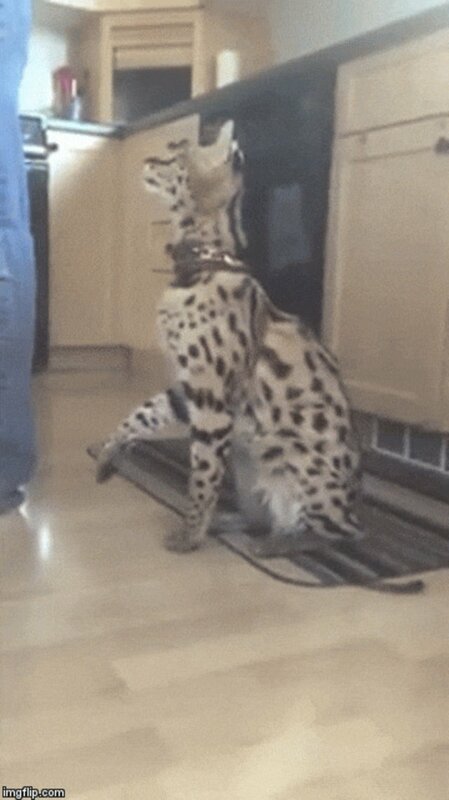 "Savannahs are commonly compared to dogs in their loyalty and they will follow their owners around the house like a canine," one internet breeder claims, adding, "Some owners even shower with their Savannah cats." And other, errr... creative reprurposing of reality. 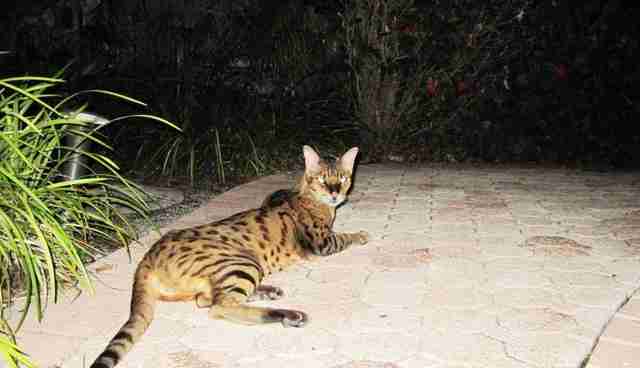 The real deal on Savannah cats? "We get calls all the time from people asking us - begging us - to take them off their hands," Susan Bass of Big Cat Rescue, a sanctuary in Tampa, Florida, tells The Dodo. The trouble, she says, is it takes a long time to breed the wild out of a wild animal. "You have to go through at least five generations to get a cat that's even remotely docile enough to live in someone's family," Bass says. How's that working for you, Savannah? "They are notorious for howling at night," Bass explains. "They bite. They can't be controlled. They are going to spray all over your house. They aren't safe to have around children or elderly people." Not to forget the "very acidic foul-smelling urine. They'll get it all over everything." "They're like the opposite of dogs," Bass adds. For all this cat's undeniable beauty, he probably shouldn't have been here to begin with. The Savannah cat didn't spring into the world accidentally. According to devotees of the breed, a woman named Judee Frank brought the first one into the world back in 1986 after an African serval mated with a standard-issue feline - a union that was doubtless difficult for all parties. The new breed proved remarkably fertile, producing multiple litters. And from there, things got really deliberate. By 2001, Savannah breeders had successfully lobbied The International Cat Association (TICA) to accept the animal as a distinct registered breed. "The bottom line is there's no reason to do it," Bass says. "There are thousands and thousands of domestic cats in shelters waiting for homes. People take advantage of those who want something special and unique and different by breeding these cats - which is cruel to the cat - and then they charge thousands and thousands of dollars for the animal." In fact, as shelters grow even more desperately crowded, the adopt-don't-shop mantra has never been crucial as it is today. But, for better or worse, these cats already walk among us. The best we can do is care for the ones who inevitably fade from fad to rescue. "Having received calls to rescue another four (Savannah cats) in the past two weeks and having more at our sanctuary than any other wild cat sanctuary in the country, this has become an uphill battle we're fighting trying to educate against purchasing these cats," Julie Hanan, advocacy coordinator at the Wildcat Sanctuary in Minnesota, tells The Dodo. 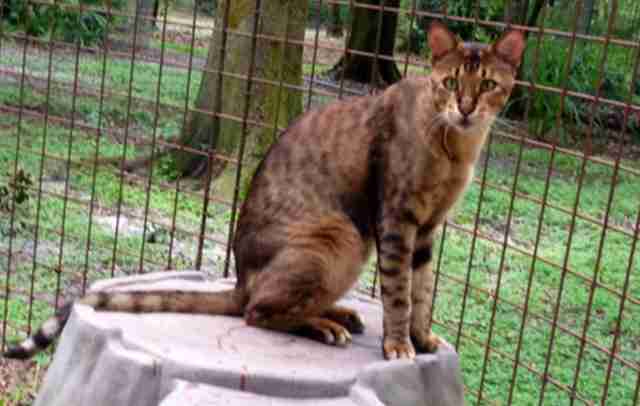 You can look at the fast-growing list of Savannah cats currently living at the sanctuary here. And if you're really itching for an animal that plays fetch, cuddles in bed and follows you around everywhere, please consider an animal that's been doing just that for centuries: a dog. If you're looking for a cat to call your own, visit Adopt-a-Pet.com and save a life while you're at it.